I’ve been a little obsessed with Dutch Baby Pancakes lately. They’re just so easy and fun that they make the perfect weekend breakfast splurge. And I’m all about doing up breakfast big on the weekend. 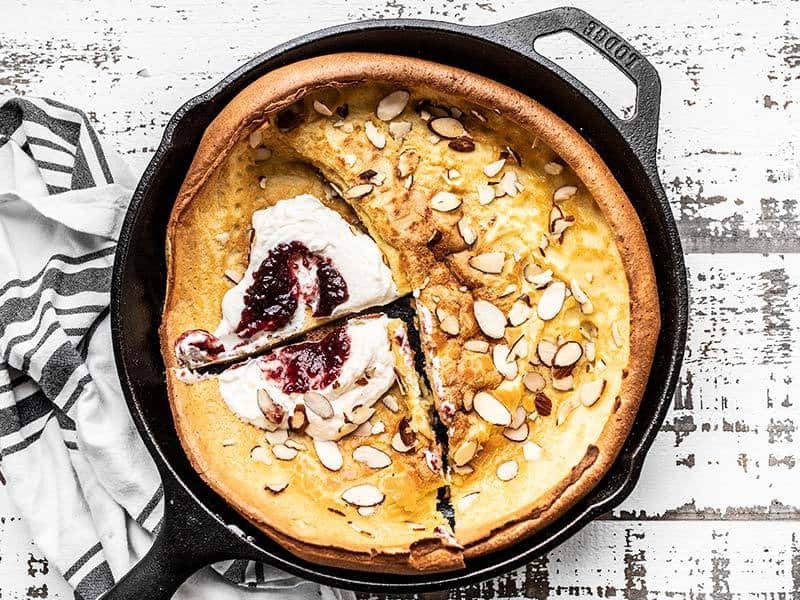 I’ve made one per week for the past few weeks and have experimented with add-ins and toppings each time, finally deciding that this Almond Dutch Baby with Ricotta and Jam is my favorite mix of simplicity and YUM. What is a Dutch Baby Pancake? Think of a Dutch Baby like a cross between a popover and a crepe. It’s essentially a giant skillet pancake made with a thin, eggy batter that puffs up with steam as it bakes. Once it’s removed from the oven it does deflate, but its unique shape, which is different every single time, remains. The baked pancake is light, more eggy, and less cake-like than traditional American pancakes. You can top your Dutch Baby with fruit, jam, syrup, honey, powdered sugar, nuts, or whatever you like! Do I Have to Use a Cast Iron Skillet? 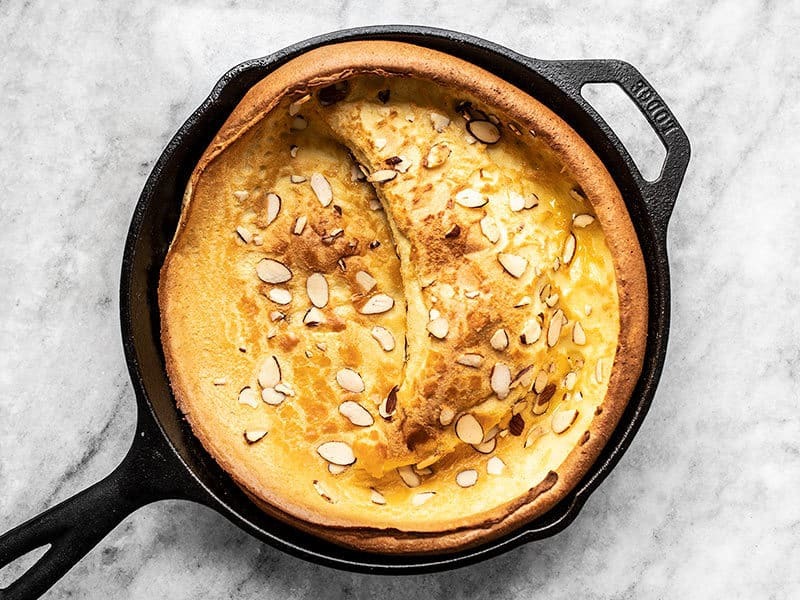 I’ll be honest, I haven’t tried making a Dutch Baby without a cast iron skillet simply because I know that nothing else gets quite as hot or transmits heat quite as well as cast iron, so I don’t want to chance it. The key to a big fluffy Dutch Baby is that sudden burst of heat when the batter hits the hot skillet and that is definitely best achieved with cast iron. So it might work with a different material, but it probably won’t work quite as well. 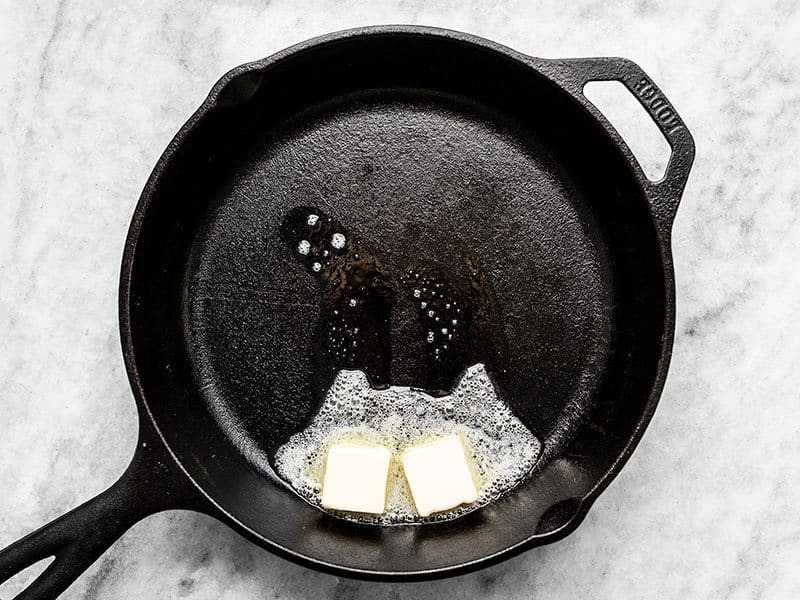 If you do decide to stray from cast iron, make sure to preheat it with your oven to get it as hot as possible, and use something round, about 9 to 10-inches in diameter. 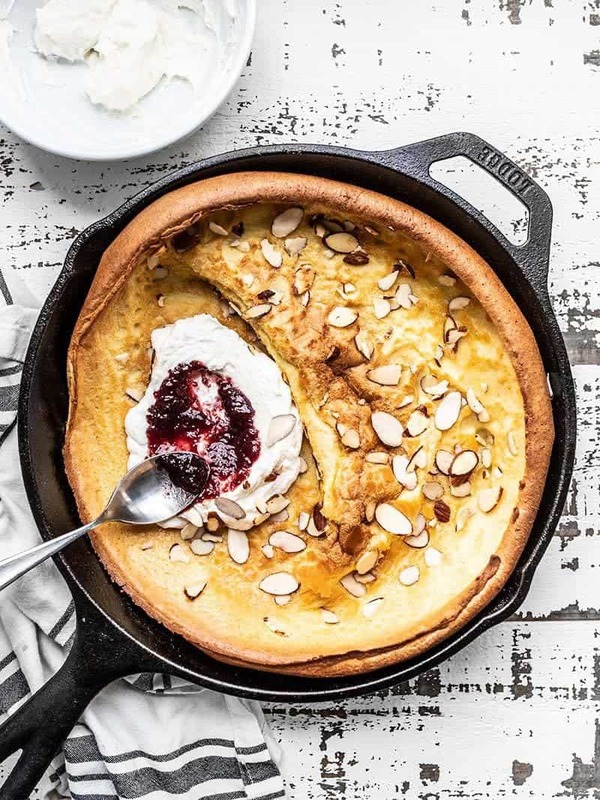 This Almond Dutch Baby with Ricotta and Jam is an easy way to dress up a lazy weekend brunch at home. Customize the add-ins and toppings to fit your mood! Prepare the batter first, so it has some time to come up to room temperature. 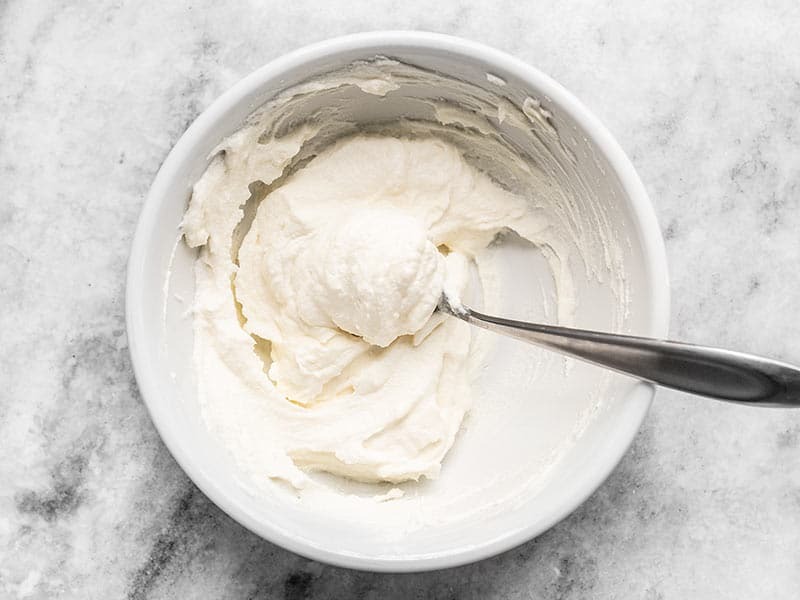 In a blender, combine the eggs, milk, flour, sugar, salt, almond extract and vanilla extract. Blend until completely smooth and no lumps remain. Let the batter sit at room temperature to warm. Place a 10-inch cast iron skillet in the oven and begin preheating to 425ºF. Let the skillet heat in the oven for an additional 10 minutes once the oven reaches the set temperature. Carefully remove the skillet from the oven and add the butter. Swirl the butter in the skillet and place it back in the oven for one minute. After one minute the butter should be beginning to brown. Carefully remove the skillet from the oven again and spread the butter evenly across the bottom and up the sides of the skillet (I used a silicone brush for this). Pour the prepared batter into the hot skillet and sprinkle the sliced almonds over top. Return the hot skillet to the hot oven and bake for 20 minutes, or until it is golden brown and has puffed along the edges and in the center. While the Dutch baby is in the oven, combine the remaining 1/2 Tbsp of sugar with the ricotta. 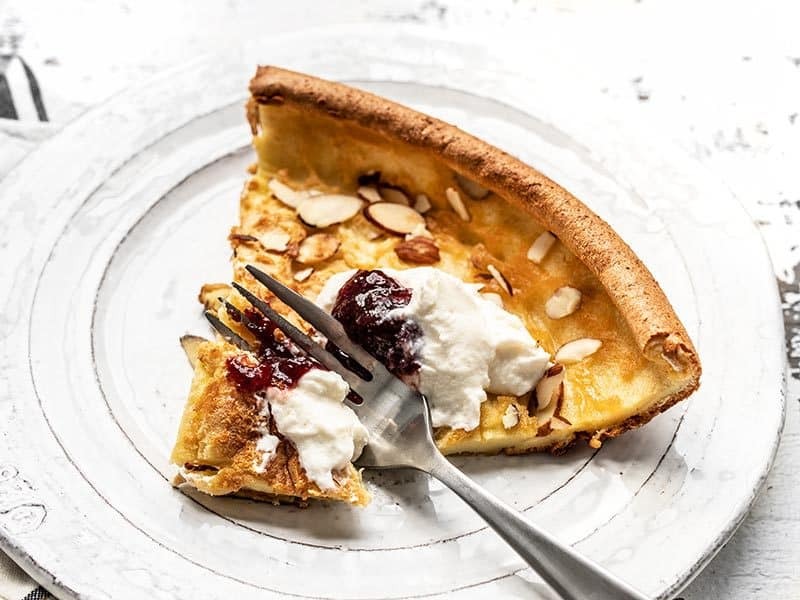 Once the Dutch baby has finished baking, either add a dollop of the sweetened ricotta to the whole pancake and top with jam for presentation, or slice the pancake into four pieces and add 2 Tbsp sweetened ricotta and 1 Tbsp jam to each piece. Make the batter for the Dutch baby first, so it has time to come up to room temperature. You’ll get better puffing that way. 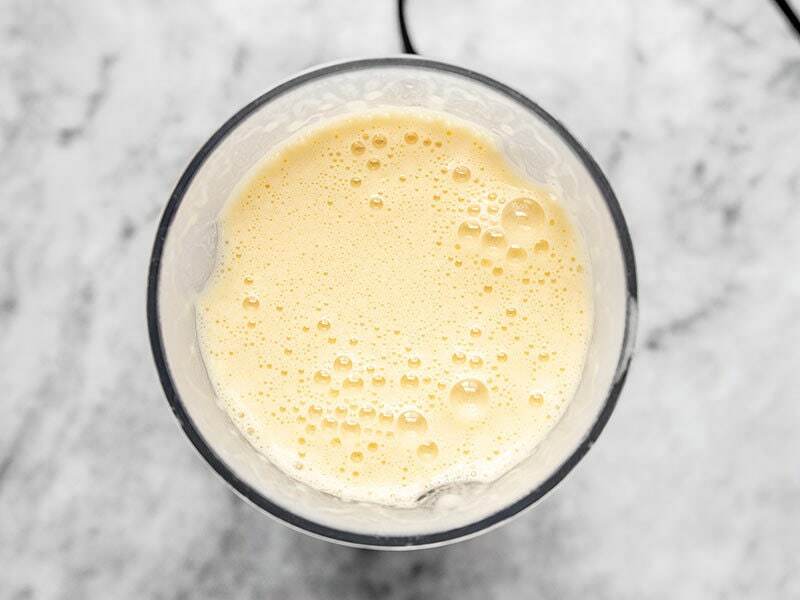 In a blender combine 3 large eggs, 2/3 cup milk, 2/3 cup all-purpose flour, 1 Tbsp sugar, 1/4 tsp salt, 1/4 tsp almond extract, and 1/4 tsp vanilla extract. Blend until completely smooth, then set it aside. Place a 10-inch cast iron skillet in your oven and begin preheating to 425ºF. Once the oven reaches 425, let the skillet continue to heat for about 10 minutes. You want the skillet to be SCREAMING hot. Once preheated, carefully remove the skillet from the oven and add 2 Tbsp butter. 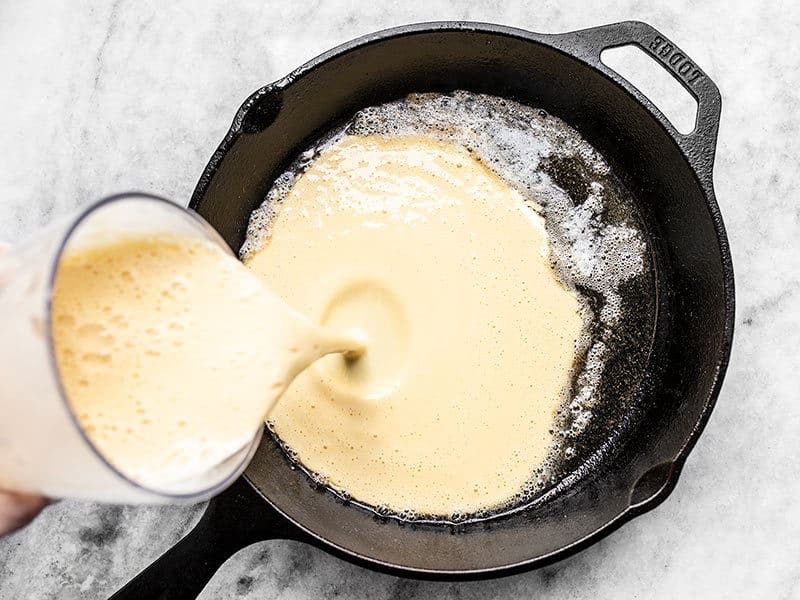 Swirl the butter in the skillet, then return it to the oven for 1 minute. After one minute the butter should be beginning to brown, so carefully remove the skillet from the oven again. Make sure the browned butter is spread over the entire surface of the skillet, and up the sides (I used a silicone brush). Pour the prepared batter into the hot skillet, then sprinkle 2 Tbsp sliced almonds over top. Return the skillet to the oven and bake for 20 minutes. 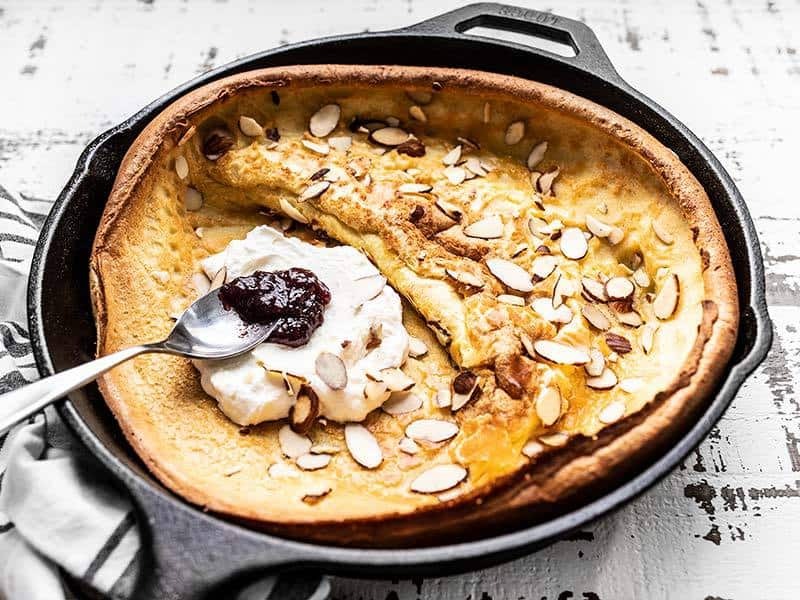 While the Almond Dutch Baby is baking, combine 1/2 cup ricotta with 1/2 Tbsp sugar. After 20 minutes the almond Dutch baby should be puffed up really high all around the edges, golden brown, and puffed in the center as well. Remove the Dutch baby from the oven. The pancake will immediately begin to deflate, but don’t worry, that’s normal. So much fun! And I promise, once you make one, you won’t be able to stop experimenting with flavors. You can even go savory! Thank you, Beth! I made it last weekend with everything but ricotta and today I gave it another try with ricotta. Kids preferred without, I liked it with. Recipe voted as a regular in our breakfast rotation. Like another reviewer, I used 12” cast iron. Delicious & fun!!! I just made it in a 10 inch stainless steel pan and it turned out so well! I usually use my cast iron, but I can confirm that a ceramic casserole dish works totally fine too, as long as you keep it in the over to heat up. Delicious and easy! My cast iron pan is 12″ so the batter was spread a little more thinly in the pan. I set my timer for 15 minutes to account for the thinner batter, but probably left it in the over for about 16 or 17 minutes – I just kept an eye on it through the door to make sure it didn’t get too brown. I left out the almonds and almond extract because I didn’t have them, but I’m definitely going to pick up some almond extract to use in this in the future. I served it with a sprinkle of cinnamon and a light drizzle of maple syrup.